The What: SoundTube Entertainment has introduced in-ceiling and surface-mount speakers that operate on the popular Dante networking platform. The What Else: SoundTube first introduced IP-addressable speakers in 2014 with its STNet system. 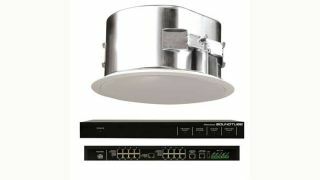 The initial system operated on the CobraNet platform and included a proprietary switch with up to 40 watts PoE (power over ethernet) per speaker and connections for up to 16 speakers (expandable). With a Dante system, the same STNet switch is used. A Dante system controller DSP connects to the STNet Switch using one of its two gigabit ethernet ports; the second ethernet port is used for system expansion. Each speaker in an STNet system can be set up and equalized separately, and can operate as its own zone or as part of a larger zone. Configuration is done via software; no re-wiring is needed if the system requirements change. In conjunction with the Dante speaker system release, SoundTube demonstrated speaker monitoring software that can keep track of all STNet IP-capable speakers in a system. The software graphically indicates zones (or blocks of speakers). If a problem exists the zone/block graphic indicates a fault; clicking on the block will bring up the information on that zone and will identify the speaker that is having an issue. The Bottom Line: Availability on the Dante-enabled STNet system is planned for summer 2016. CobraNet-enabled models will continue to be available.